Doctors of Deception: What they Don't Want You to Know About Shock Treatment, by Linda Andre, Rutgers University Press, 2009.
Review by Dr. Stefan Kruszewski in the International Journal of Risk & Safety in Medicine (2009) 171-173. ECT Resources Center from Peter R. Breggin M.D. The Truth About Electroshock pamphlet. International Campaign to Ban Electroshock (ICBE). PsychRights and Committee for Truth in Psychiatry submission to FDA opposing reclassification of electroshock machines, March 25, 2016. The Utmost Discretion: How Presumed Prudence Leaves Children Susceptible to Electroshock, by Cheryl van Daalen-Smith, Simon Adam, Peter Breggin, and Brenda A. LeFrancois, Children & Society VOLUME 28, (2014) pp. 205–217. January 24, 2011, PsychRights letter to the Food and Drug Administration, re: Docket No. FDA-2010-N-0585-0001, Reclassification of Electroshock Machines. Electroconvulsive therapy reduces frontal cortical connectivity in severe depressive disorder, by Jennifer S. Perrina, Susanne Merz, Daniel M. Bennett, James Currie, Douglas J. Steele, Ian C. Reid, and Christian Schwarzbauer, Proceedings of the National Academy of Science, 2012. The effectiveness of electroconvulsive therapy:: A literature review, by John Read and Richard Bentall, epidemiologia e Psichiatria Sociale, 19: 4 (2010). The FDA Should Test Safety of ECT Machines, by Peter R. Breggin, International Journal of Risk & Safety in Medicine, 22:89-92 (2010). The Cognitive Effects of Electroconvulsive Therapy in Community Settings, Harold A Sackeim, Joan Prudic, Rice Fuller, John Keilp, Philip W Lavori and Mark Olfson, Neuropsychopharmacology (2007) 32, 244–254. This study, which it says is the first of its kind despite the long-standing controversy over the brain damage caused by Electroshock found that it does indeed cause cognitive deficits. "This study provides the first evidence in a large, prospective sample that adverse cognitive effects can persist for an extended period, and that they characterize routine treatment with ECT in community settings,"
Electroshock Quotationary, June 2006, by Leonard Roy Frank. Medical Accountability Network's January 26, 2006, letter to Seton. 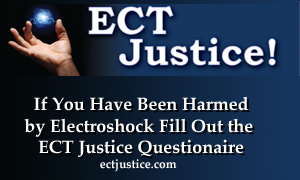 There are links to many studies on Electroshock at http://www.ect.org/resources/studies.html. Cognitive rehabilitation: assessment and treatment of persistent memory impairments following ECT, Maeve A. Mangaoang & Jim V. Lucey, Advances in Psychiatric Treatment vol 13, 90-100 (2007). All-cause mortality among recipients of electroconvulsive therapy, by Trine Munk-Olsen, Thomas Munk Laursen, Poul Videbech, Preben Bo Mortensen and Raben Rosenberg, British Journal of Psychiatry, 190: 435-439 (2007). Eliciting users' views of ECT in two mental health trusts with a user-designed questionnaire, by Michael Philpot, Cath Collins, Premila Trefeci, Adrian Treloar, Simon Gallacher, & Diana Rose, Journal of Mental Health, 12(4): 403-413 (2004). December, 2003, Committee for Truth in Psychiatry (CTIP) Petition to Maintain the ECT Device in Class III. Effectiveness of Electroconvulsive Therapy in Community Settings, by Joan Prudic, Mark Olfson, Steven C. Marcus, Rice B. Fuller, and Harold A. Sackeim, Biological Psychiatry, 44-301-312 (2004). Linda Andre's Bibliography on Electroshock. The Brain Changes Associated with Electrical Shock Treatment: A Critical Review, by Bernard J. Alpers, MD, Lancet, 66 (1946), 363-369. ECT and Minors: Social Sciences Solutions Will Reform the Psychiatric Abuse of Infants, Children and Adolescents, by Steve Baldwin and Melissa Oxlad, Social Sicences in Health 1996 (2)(3); 174. Differential Memory Complaints After Bilateral and Unilateral ECT, by Joanne Rosenberg, M.S., and Helen M. Pettinati, Ph.D., Am J Psychiatry 141:9, September 1984. ECT: shock, lies and psychiatry, Yvonne Jones and Steve Baldwin, CHANGES, June 1992.